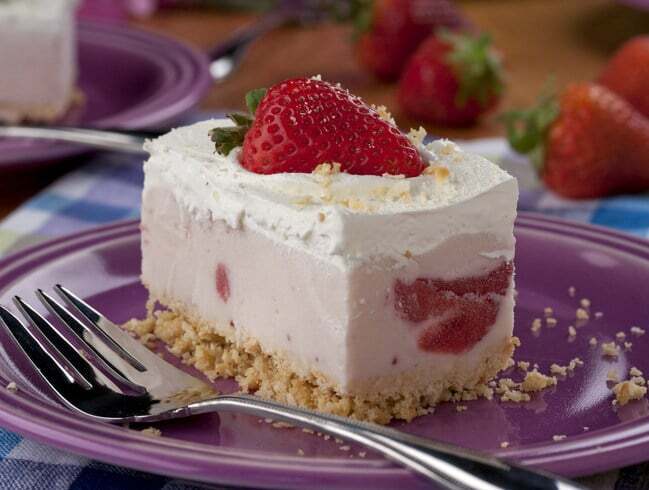 Check out the delicious Berry Cheesecake Ice Cream Squares recipe (and more) at EasyHomeMeals.com. People living in the United States indulge in ice cream more than any nation in the world, averaging a whopping 48 pints per person, per year. Ninety-eight percent of all U.S. households purchase ice cream, with more sold on Sunday than any other day of the week. Eighty-seven percent have ice cream in their freezer at any given time. The National Frozen & Refrigerated Foods Association (NFRA) is celebrating this love for cool treats with their annual Summer Favorites Ice Cream & Novelties promotion, and sharing these cool ice cream facts below. A cow gives enough milk to make 2 gallons of ice cream per day – that’s 730 gallons per year. The most popular ice cream flavors are Vanilla, Chocolate, Cookies ‘n Cream, Strawberry and Mint Chocolate Chip. NFRA reminds you to make the ice cream aisle your last stop, to keep your frozen purchases in a separate section of the cart while shopping, and to pack your ice cream in an additional brown paper bag for the ride home. They also suggest that you store your frozen treats in the main part of the freezer, not on the door, where they are subject to more fluctuating temperatures. This entry was posted in Recipes and tagged dessert. Bookmark the permalink.